Game-Guru is an entry-level engine designed to be easy to use as well as being extremely accessible for the user. This book gives users the information needed to access the full depth of features available in the program. Details on how to perform more complex tasks are not found easily anywhere else or in any of the Game-Guru documentation. This book will cover all of the common topics including building levels, coding, AI and more. 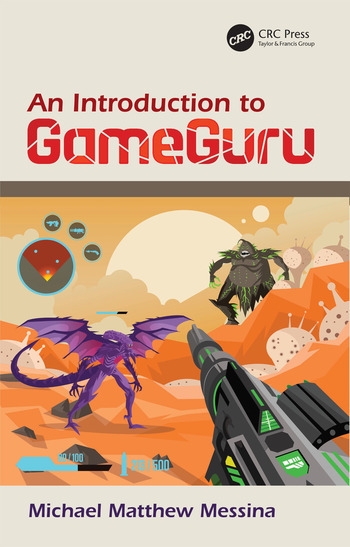 The only book the fully covers the Game-Guru engine. Includes robust documentation to perform complex tasks that are not outlined anywhere else. Includes level building, coding, AI and more. Included are scripts and demo maps for readers to learn from. Licensing Information. Introduction: About 3D Games. About This Book. Game-Guru for Game Development. A Brief History of FPS Games. A Design Flow Document. Using Game-Guru. Building Your First Game. Adding Simple Functionality. Adding Effective Enemies. Advanced Lighting. LUA Code Introduction. 3D Math for Dummies. Intermediate LUA Code. Advanced AI. Rebuilding Your First Game. Building a Standalone. Testing Your Product. Optimization (And More Testing). Finishing Touches. Marketing, Selling and Licensure. Error Code Appendix. FPI/FPE File Definitions. Light Value Charts. Gunspec Settings. Glossary. Index. Michael Messina is currently Chief Linux Systems Engineer for Rite Aid Corp. He has had an interest in game development since coding basic games on an 8086. Michael has written bots, levels and mods for Quake, Mechwarrior 4 and others. Michael is the creator of the Game-Guru Advanced Time of Day and Weather system, Light Kit, Camera Kit and other script-based items.